Late in the day near Fernie there is a shadow on Hosmer Mountain of a horse, a rider and a person. There is a legend relating these people to the discovery of coal and a curse which was placed on the city causing devastating fires, floods and a mine disaster in the early 20th Century. There was a curse-lifting ceremony in 1964. 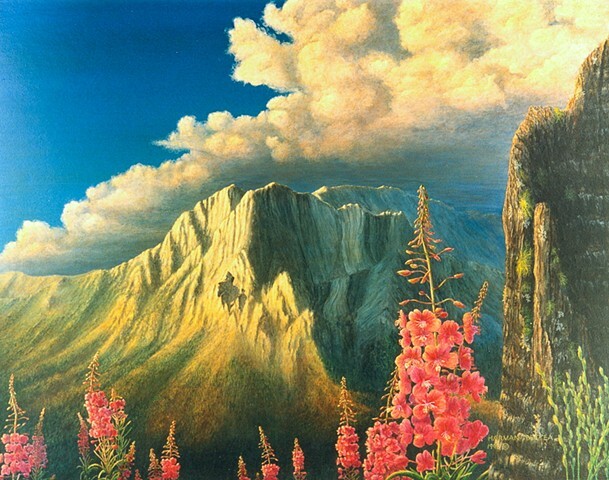 My painting shows threatening clouds with a burnt stump and fireweed flowers which resulted from fire.